All aboriginal or native cultures have what could be called a "Taoistic" way of perceiving life and the world. The American Indian, the Eskimo, the Aborigines of Australia, the tribes of Africa, they, like the Chinese, not only share a belief that the world is alive, but actually see that life in the world itself. There is a shared realization in native cultures that one learns most from what is, because what is is alive. Aboriginals viscerally know that our world and selves have evolved together over billions of years and are connected by the finest and most delicate web of living substance. They are led by this knowing. Knowing tells them how to stay within the web of life. They already know what we, as a society, have yet to experience; our bodies and world "talk" to us all the time and bring valuable sensibilities; alive information within the web of life. So in addition to the traditional work with the T'ai-Chi form we will be working with various experiential exercises designed to awaken our sensibilities to the Tao of life. We will attempt relearning the ability to smell, feel, touch, taste, and see like a native of our living planet. We will awaken our knowing of the delicate web of life and our self-evident place within it. I can not over emphasize the experiential nature of the work. To partake of the knowing, one must be in direct experiential contact with the web of life. Without this contact, there is no knowing. 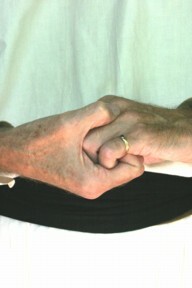 In T'ai-Chi we will work with this web of life known as Tao through our awareness in the energetic body of life. Our imagination is the most valuable aid to discovery we have. Where imagination is wedded to experience knowing is born.